Register now to remove this banner! 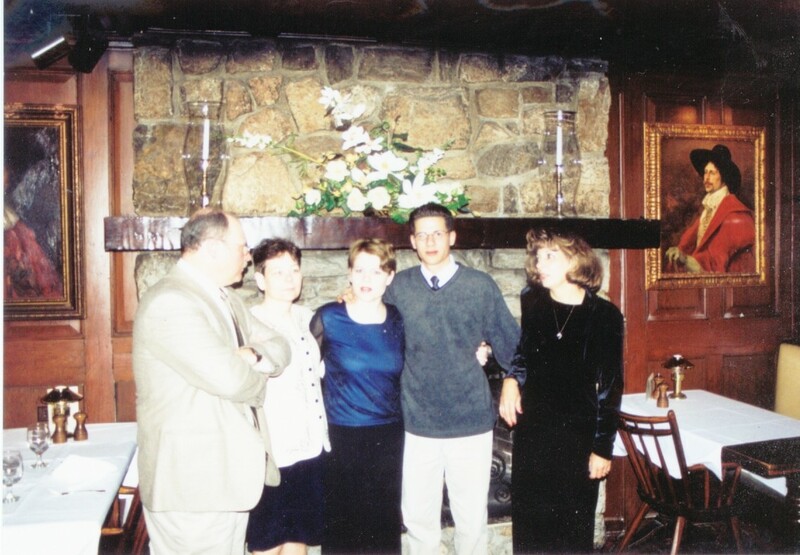 Left picture: from our reception in New Orleans, February 2001. 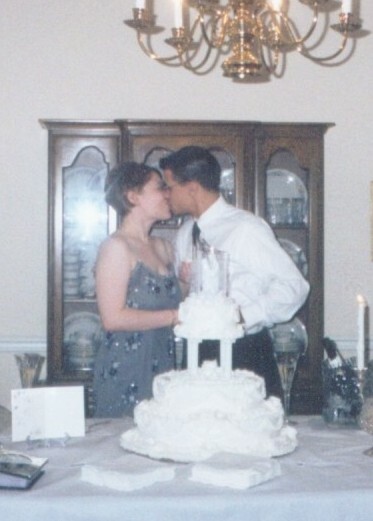 And, us just after being married, January 11, 2001. 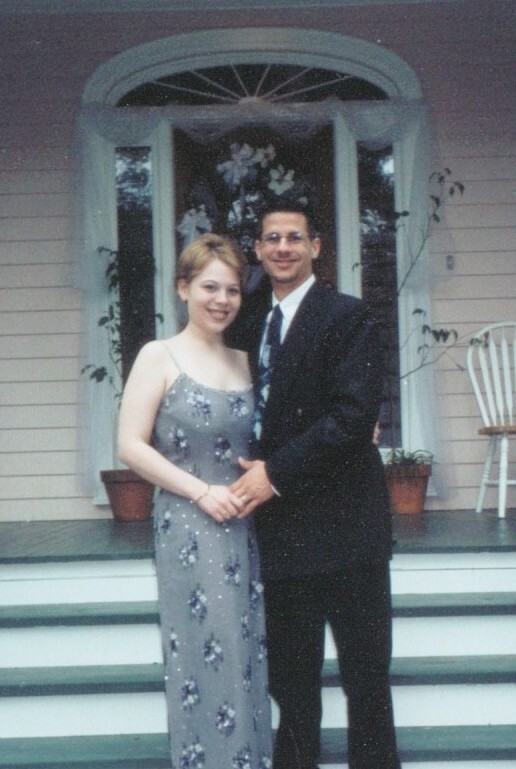 Dave and I have an interesting meeting and marriage story. 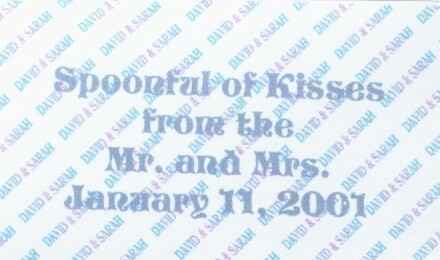 We met in December of 2000, and were married by January 2001. Yes, a whole 5 weeks later. Dave was in the Air Force and set to move to Portugal. We had to act quickly! 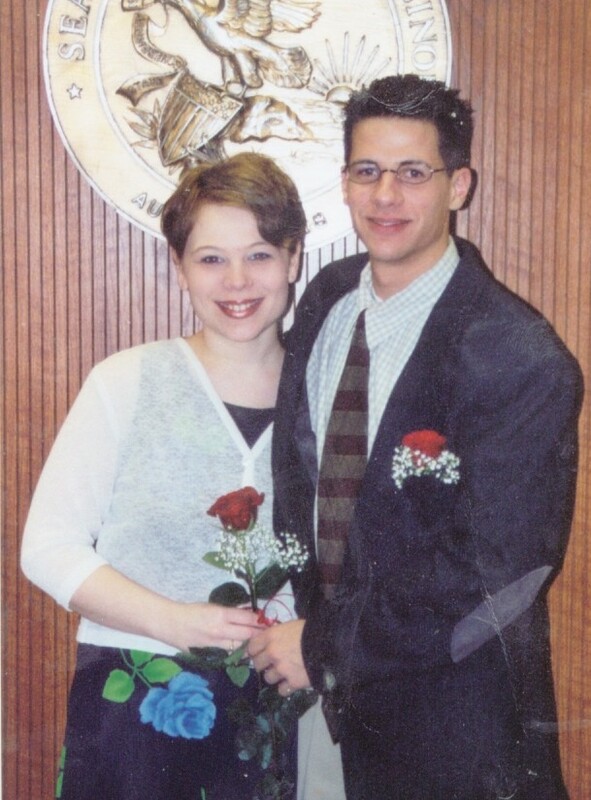 Given the fact that we married quickly, we married at the Waterloo Court House on January 11, 2001 at 1p.m. 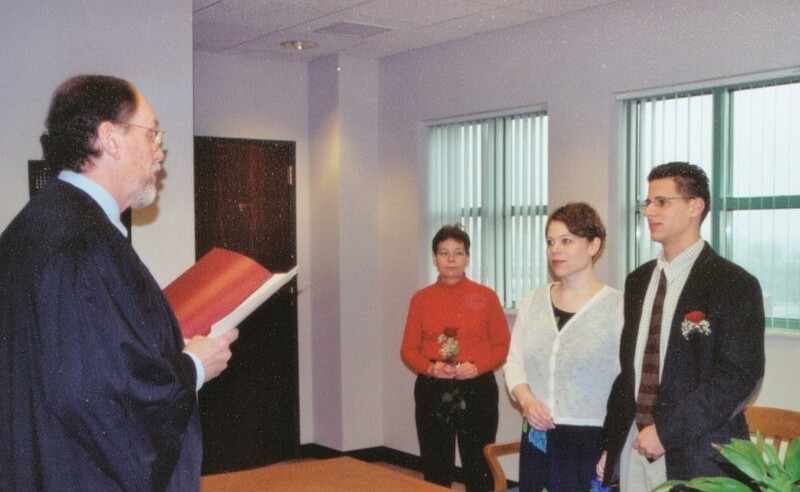 My mom and dad were able to come, and act as witnesses. Dad was our photographer, as well. They also made our ceremony even more special by providing roses for each of us. 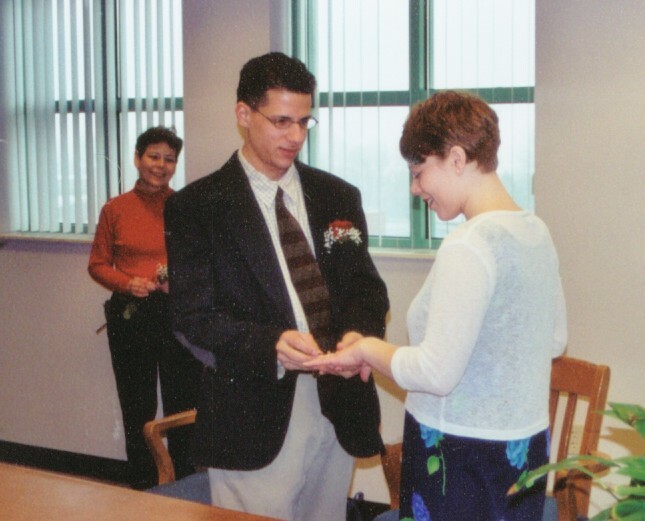 Getting ready to be married in the Waterloo Court House; Waterloo, Illinois; January 11, 2001. After we were married, in late January, Dave's family drove up form New Orleans and my parents hosted a dinner at the Cheshire Inn in Clayton, Missouri. It was a small gathering of family. It was beautiful with the fireplace going, the pianist playing on the piano, etc. It was a great meal and good company. We were presented with gifts and toasts from family. It was really nice. 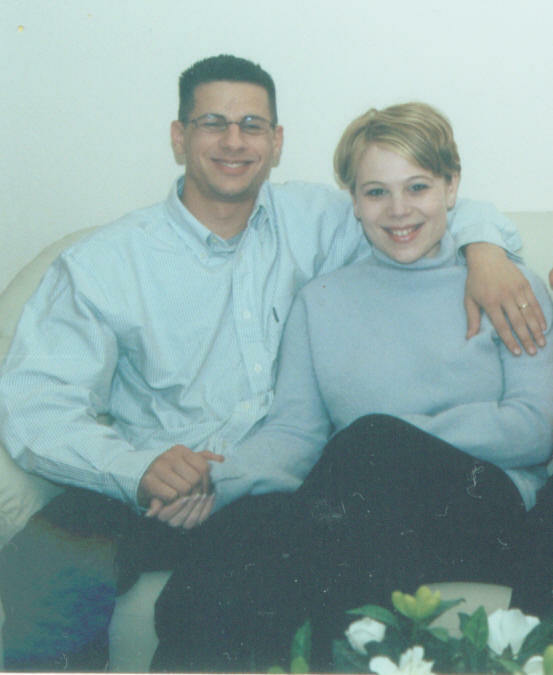 It was the first time our parents met, as well! 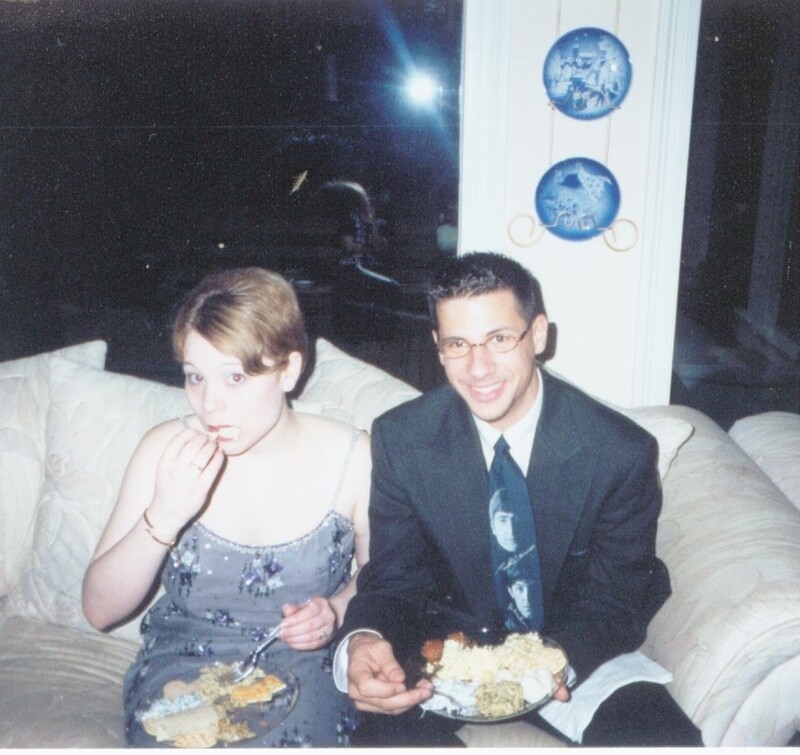 Our dinner in St. Louis; Jan. 2001. Dad, Mom and Dave's mom, Carmen. Notice the look on my face - we are trying to figure out the best way to take the picture. After the festivities in Waterloo/St. Louis, it was time to move out of my apartment, (that had become our apartment ). We had to go up to Dave's Air Force Base in New Jersey to settle his time there. 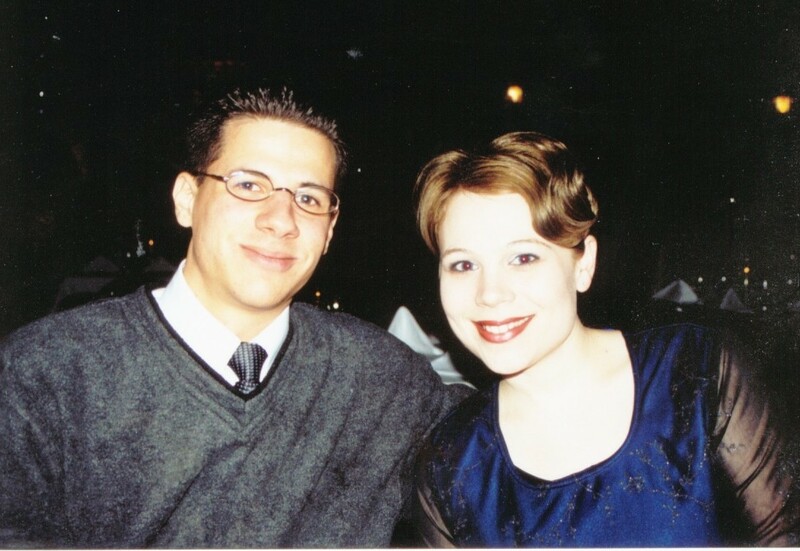 While in New Jersey, we visited New York City for our first Valentine's Day together. We saw a bunch of the sites. Although, all the pictures I took (except for two) came out fuzzy!! So, I have no pictures of New York to share. We saw the Grand Central Station, St. Patrick's Cathedral, Central Park, the Dakota (where Lennon was shot) and the "Imagine" Memorial to him in Central Park. We finished the 8 hour day, by eating at a Mediterranean Restaurant. Then, it was down to New Orleans for more festivities before moving to Azores, Portugal. 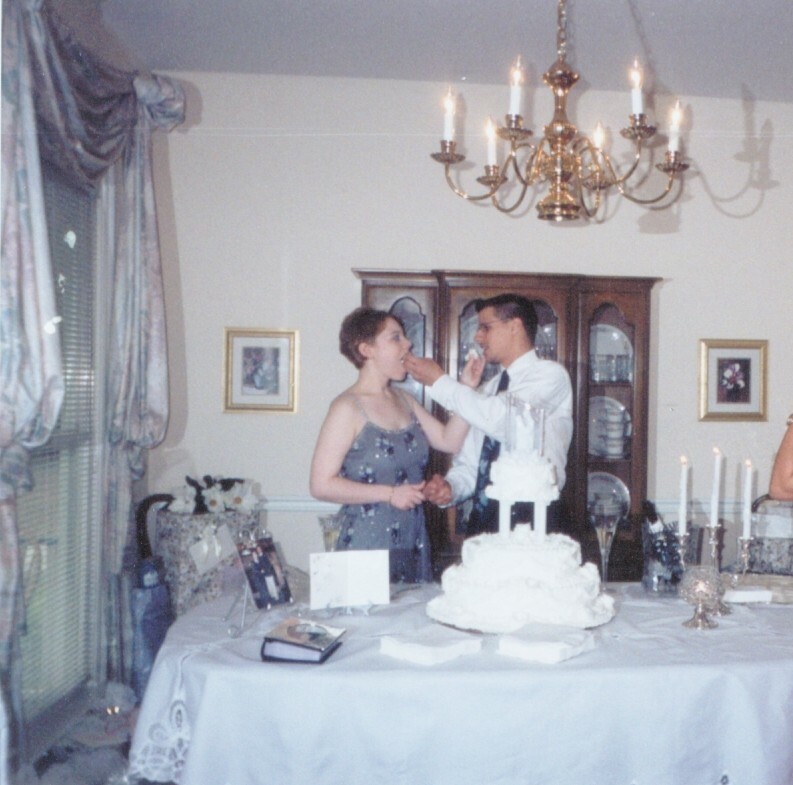 While in New Orleans, Dave's parents threw us a reception in February. It was wonderful! 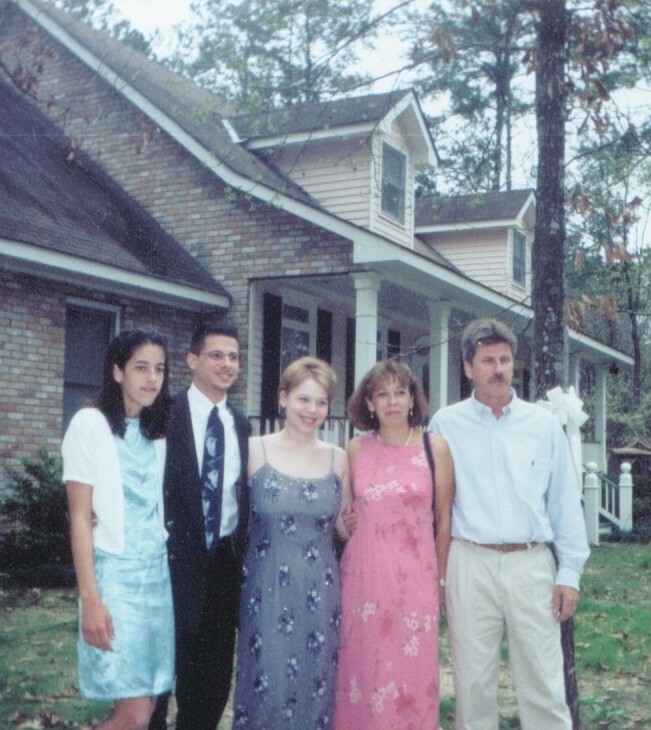 They hosted at their home and I met so many members of Dave's family, and friends of the family. It was so nice. My Aunt Nancy and one of her friends; and my Aunt Lee and Uncle Charles were able to make it to our reception in New Orleans. 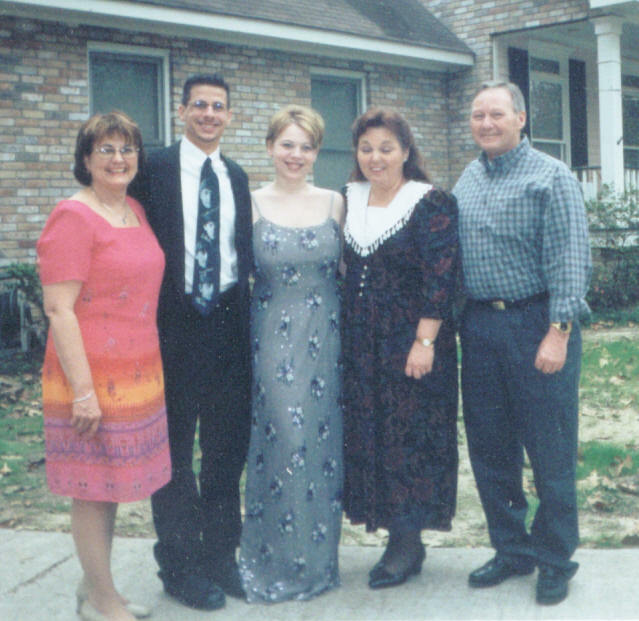 Dave's sister, Brittany; and his parents, David and Carmen. Feeding each other our cake. 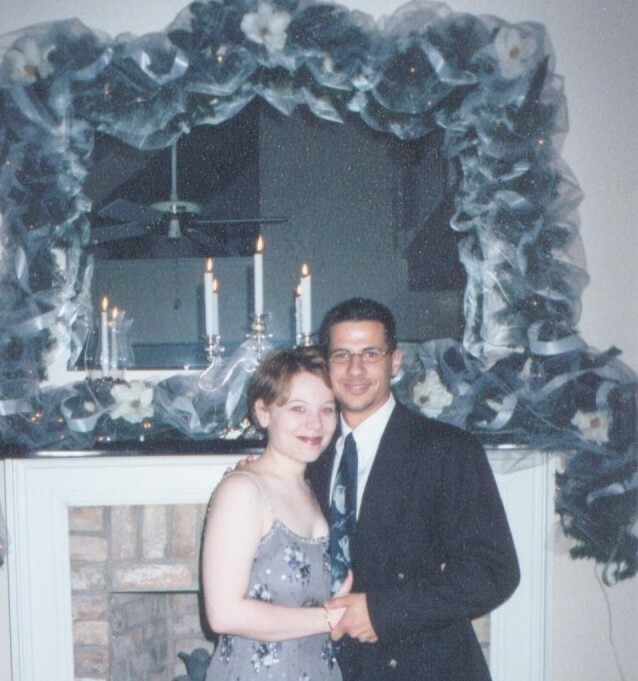 Dave and I; Feb. 2001. Me, stuffing my face. We are enjoying the meal at our reception! I was so sick in this picture! Mardi Gras 2001. While in New Orleans, we were able to enjoy some of the sites. We happened to be down there in time for Mardi Gras. We didn't do the whole French Quarter thing (too crazy), but we did go to three family friendly parades. All we had to do for our beads was smile and wave our hands. :) See picture, above-right. After New Orleans, we had a chance to go back up to St. Louis/Waterloo to say final goodbye's before heading out to the Azores. 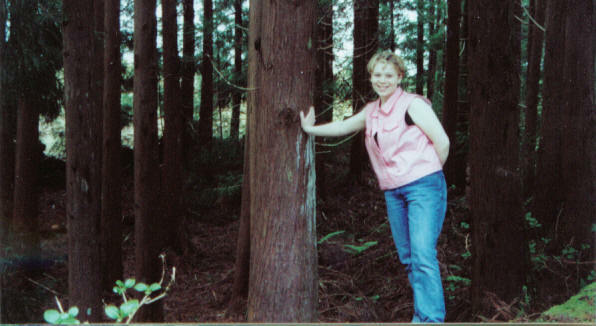 So, early March '01, we went up for a short visit. Me, thinking something is funny. 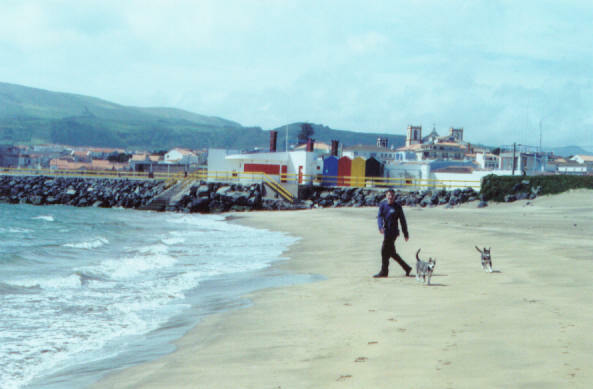 It was off to the Azores for us in March 2001! It was my first time flying over a big body of water. It was an awesome experience to look out my window and see the cliffs of the island where they met the ocean, as we were getting ready to land. The Azores are rural farming islands in the middle of the Atlantic, about 900 miles off the coast of Portugal. They are actually owned by Portugal. 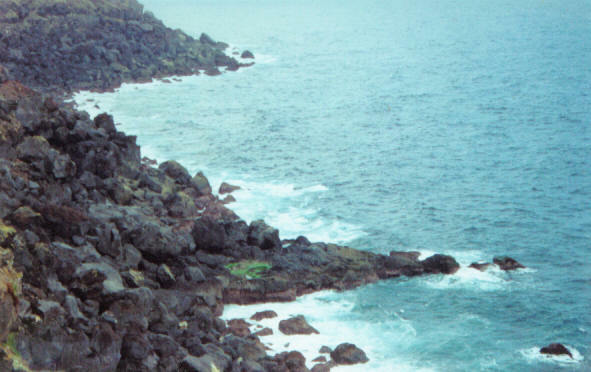 The island had rocky dramatic coastlines. It was awesome. The beautiful coastline of Terceira Island; Azores Islands, Portugal. 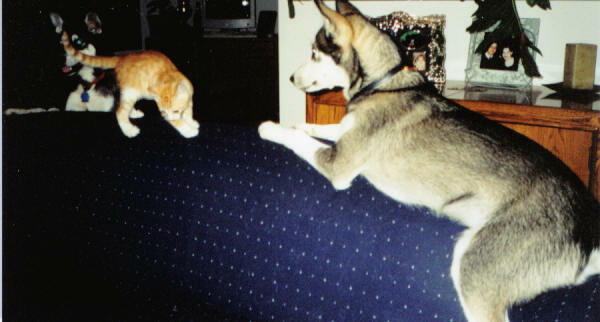 Jack, the cat, joined our family in May 2001. 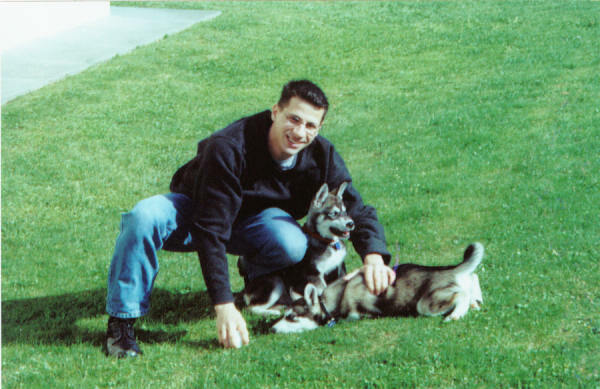 A great picture of Dave and the puppies, March 2001. 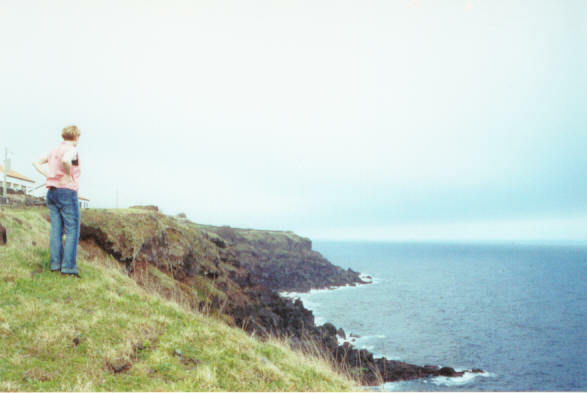 Overlooking the cliffs of Terceira Island, March 2001. Please see links below to see more pictures of the island! 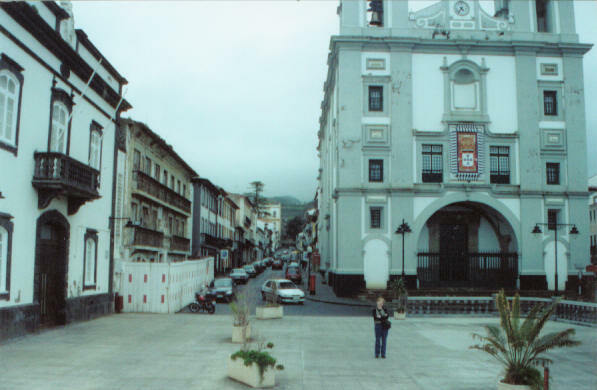 The link takes you to our very first website, The Azores Experience. Also, click the links below for the rest of our newlywed year, documented by our travels while newlyweds. Finally, the links below will take you to the rest of our newlywed year one and a half, documented by my pregnancy with Kate and Kate's arrival.